The exercise practices the protection of surface ships from submarines and fire against surface and air targets. The sailors will practise antisubmarine operations and a live-fire exercise involving surface and aerial targets in the Bay of Bengal. 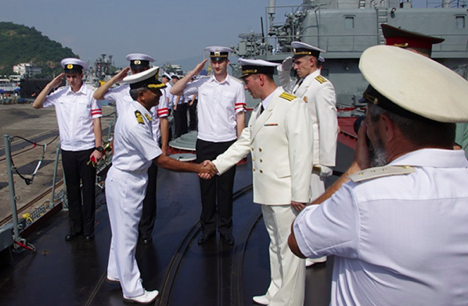 Russian and Indian warships have left the naval base in the city of Visakhapatnam in India’s south-eastern state of Andhra Pradesh, starting the second - active - phase of the 8th joint naval exercise Indra that ends on December 12. Following the onshore phase (on December 7-9), the sailors will practise antisubmarine operations and a live-fire exercise involving surface and aerial targets in the Bay of Bengal. The scenario also provides for assault teams supported by helicopters to reclaim a ship seized by simulated terrorists. The Indian Navy has furnished the Shivalik-class Sahyadri multirole frigate, Soviet-built Project 61-ME Nadyozhny-class Ranvir destroyer, Shakti tanker carrying the combined exercise-directing staff, Project 877EKM Sindhuvir diesel-electric submarine, a Boeing P-8 Poseidon maritime patrol plane, a Dornier Do-228 coast guard plane, two BAE Systems Hawk Mk132 trainers and several helicopters for the exercise. The Russian Navy has dispatched the Project 1164 (NATO reporting name: Slava-class) Varyag guided missile cruiser, Project 956 (Sovremenny-class) Bystry destroyer, Boris Butoma oceangoing tanker and Alatau rescue tug to participate in Indra 2015. Launched in quite a modest format in 2003, these naval exercises have grown into full-scale maneuvers with bigger capacity, complexity of operations and the level of participation. In November, Russia and India held a joint ground exercise Indra with more than 500 men on both sides taking part. Operations against armed groups and mine clearing were practiced.